“Damn right your dad drank it.” That’s the on-the-mark tagline of Canadian Club whiskey, a spirit everyone’s heard of but seemingly few under 40 have tried. Before this review I had tried the original Canadian Club, a six year whiskey, but not its more mature sibling, the Canadian Club Classic 12 Year Old. This whiskey is aged 12 years in re-charred oak barrels and created with corn and rye, combined with rye malt and barley malt. The resulting spirit has a vibrant orange-bronze color. On the nose the Canadian Club Classic is soft with a creamy sherry aroma reminiscent of eggnog. When I got down to tasting, I found a smooth body with cream, vanilla, bread, and oak. It reminded me of some of my favorite American ryes—not surprising considering that Canadian whiskey is traditionally made with a high percentage of rye. In addition, there is a subtle woody spice and the finish is dry and smooth. 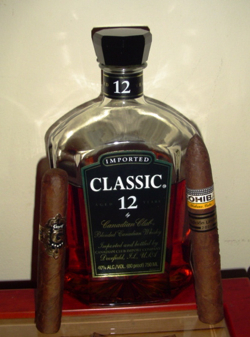 With it’s vanilla, cream, and woody flavors, there is plenty to pair up with a fine cigar. I’d recommend the Arganese Edición Especial 2008, Isla de Cuba Classic, EO Cubao, Oliva Series G, or Romeo y Julieta Vintage, all which have prominent cream or cedar notes. If you’re enjoying this whiskey in Canada, or some other country where Cuban cigars are widely available, I’d suggest a lesser known Cuban smoke: the Por Larrañaga Panatela. All in all, I was quite impressed with the Canadian Club Classic. Canadian whiskey is often overshadowed by the fine bourbon and scotch being produced, but this representation shows that Candian whiskey can also be a great sipping spirit. Given that a bottle is a reasonable $25, it won’t be devastating if someone uses it to make a cocktail. In fact, I bet the Canadian Club Classic 12 Year Old would make an excellent Manhattan. Personally, though, I’d take it neat. Interesting review. Sounds like a good deal at $25. BTW, Is that Cohiba LE Pyramide in the picture? Which one 2006 or 2001? Based on this review I went out and bought a bottle of this. It was actually $17 in a NH state store. It is a very tasty whiskey and is close to becoming my "everyday" whiskey because of the price. I have had it both in a small glass and in a snifter, and the snifter definitely enhances the smoothness and flavor. Highly recommend as an alternative to Scotch. This is a mild whiskey. Sort of has a kerosene hit to it but it goes with a touch, just a touch, of water. It's smooooooooth. Goes very well with a Nub Connecticut.